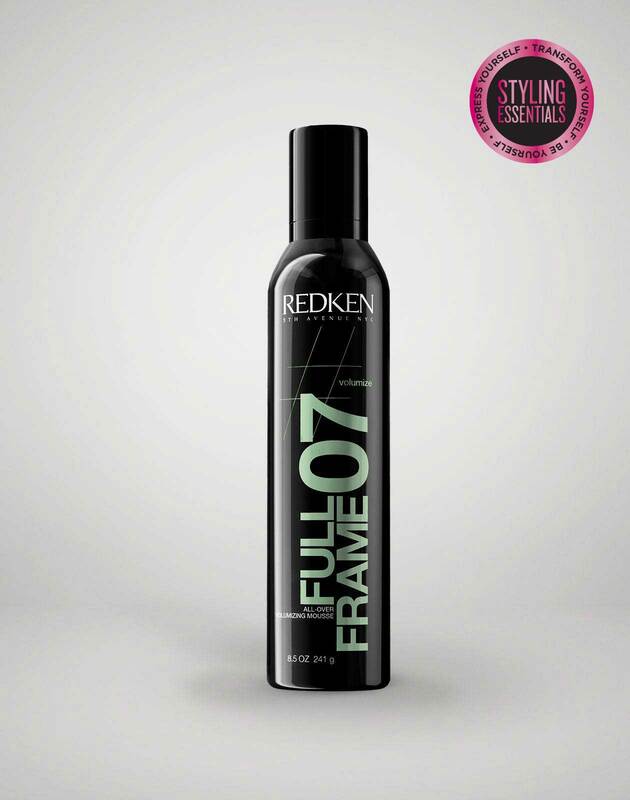 • Apply a palm sized amount of full frame 07 all over your damp hair. • Work in sections and as you work, apply more as needed. 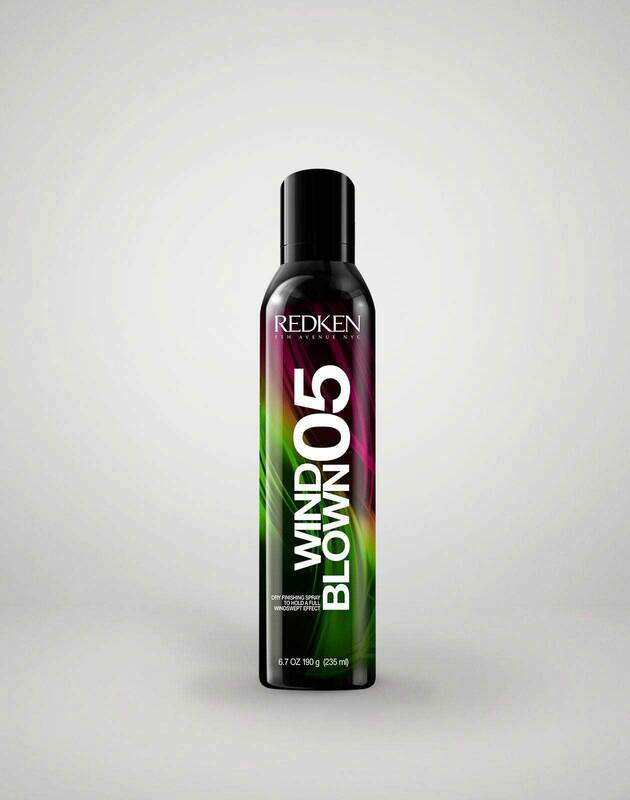 • To help ease your blow-drying, separate the front from the back. Make a part that extends from ear to ear up through the crown of your head. Secure the front area with a clip. • Imagine where your finished ponytail. Starting in the back area. Working in 1/2"-1" sections, take a blow-dryer and follow with a paddle brush to smooth the hair, directing it up to where the ponytail will sit. Now in the front area, repeat smoothing the hair back. HOT TIP: Reapply full frame 07 on dry hair and blow dry again for added volume and definition concentrating on the front and crown. • Continue this technique until you’ve completed drying your whole head making it as smooth as you can. Set aside your elastics. • On the right side at the front of your hairline, in line with the arch of your right brow, create a curved section ending at the top of your opposite ear. Isolate this section with a clip. • Now you’re going smooth your hair into the ponytail. Use your paddle brush and direct the remaining hair to your desired placement for the pony. Secure with an elastic. • Apply a small amount of braid aid 03 onto the clipped-away piece in the front and create a french braid. Braid back, towards the ponytail. • Stop your braid when you reach the base of your pony. • Holding the end of the braid against the base of the ponytail, grab a loose piece of hair from the pony and wrap around the base of the pony. This will tie the braid and pony together. 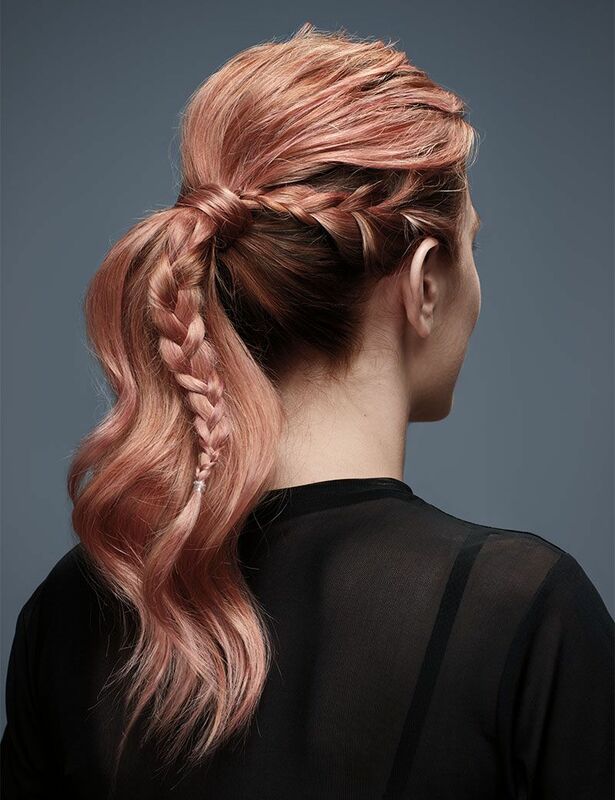 • To create the illuson of one seamless braid, grab a 2” loose section from the pony, directly under your first braid. Now create your second French braid. • Spray iron shape 11 all over and using a large curling iron, curl the ends of your pony for an elegant finish! • Finish with a mist of wind blown 05.